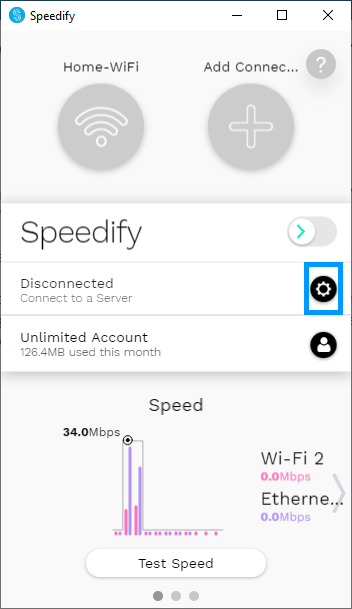 Jumbo MTU is a setting within Speedify that allows the app to accept much larger data packets into the Speedify Virtual Network Adapter. Speedify will run more efficiently and use less CPU when Jumbo MTU is enabled, resulting in higher speeds. The Jumbo MTU setting defaults to ON and most users should not have to change this setting. The setting should only be turned off if users are seeing the problems described below. Currently, the setting is managed automatically by Speedify and can only be manually set by the user when running Speedify on a Windows computer. Some Windows users see problems with web pages not loading correctly or very slow performance when Jumbo MTU is enabled. If you are seeing these problems, try turning the Jumbo MTU setting OFF by following this guide below. Open the Speedify app then click the Settings icon.